I’m always looking for ways to improve my writing, and even before last weekend’s Readathon, I had several books waiting for review. I thought the Monster Review-a-thon would help with both issues. 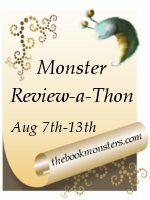 The Monster Review-a-thon was hosted by Kate and Kristen at The Book Monsters. You can blame thank them for all the reviews I posted last week. You may have also noticed I made some changes in my review format. I’m not done revamping yet, but it won’t be anything major. There were 6 mini-challenges for the week. The Review-a-thon actually ended Saturday, but I was busy being relaxed and away from technology for a little while, so I’m posting all this now. I’m a few days behind, but that’s never bothered me before. I’ve been just trying to fit a bit of summary into my review and sometimes I managed to give a good idea of what the book’s about and sometimes I didn’t. That was bugging me. I had also been wanting to include a little more information about the book, so I didn’t have to try to cram the info into the actual review. So I’ve started including the book summary from Amazon, as well as information such as the author, publisher, number of pages, and where I got the book. Yeah, I’m not so good at this one. I did write four reviews on Thursday, one to publish Thursday, and three scheduled for Friday, Saturday, and Sunday. That didn’t really count, though, because I would have done that anyway. I need to start writing the reviews within a day or two of reading the book, no matter when I get around to publishing it. That way I don’t forget important stuff. This is something that had bounced vaguely into my head once or twice, but wasn’t really something that was a priority. It’s still not exactly a priority, but it has moved up the list, since I’m doing so many reviews now. 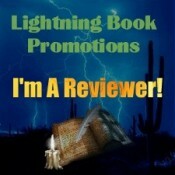 I’m going to make a page with a list of and links to all my reviews. It’ll happen, but don’t hold your breath. I had actually just done this a couple weeks ago. I’ve been relying on my memory (which is good for useless things like this, but not helpful in real life), but I decided I really need to write down all the books, where I got them, and their publication dates. 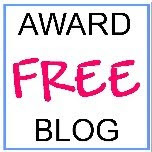 I’ve reviewed a couple of books before the publication date, and it causes confusion for my readers, because they’re looking for a book that they can’t buy yet. So I’m paying more attention to that now. That one was already done, too. I have TBR review books and library books on one shelf, separated. One stack of books on top is already-read books waiting for review. Another stack is my books waiting for a giveaway. Actually, there is quite possibly too much organization going on here, but that’s okay. It won’t last. What do you think of my new review format? Love it? Hate it?